Every single Lehigh player remembered. 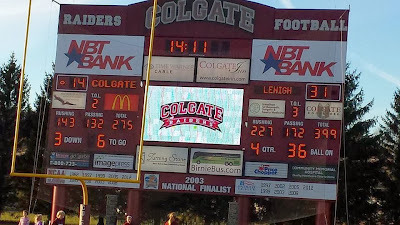 They remembered the chaos on the field last year at Murray Goodman Stadium, when Colgate beat Lehigh and celebrated on their field, Lehigh’s field, after their championship win. They remembered the team photos. The hats. The championship trophy. The championship picture. In their house. And they remembered that they didn’t want to see that again this season. For the second straight week, senior RB Keith Sherman ran over a Patriot League opponent. For the second time in two must-win games, Lehigh won a game they had to have to keep their Patriot League title and playoff hopes alive. But up in Hamilton, it wasn’t a time of whooping and hollering after the game. It was a line and a postgame handshake – in other words, business. And Lehigh, in their most complete defensive performance of the season, got their business done in very impressive fashion. Below the flip, enjoy this week’s “LFN Players of the Week” for the New Hampshire game. Here at LFN, I’m always looking for something to keep things fresh, and this year the plan is to keep things fresh by combining the “LFN Players of the Week” with something new: the two-minute drill. 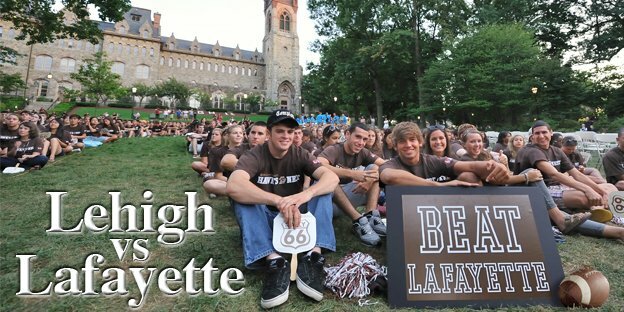 In the past, I used to have a “press roundup” with links to all the recaps and interesting articles that would emerge concerning Lehigh football. In a world without Twitter and Facebook, this type of content curation was great not only for people who liked my blog, but for me, too, when wanting to refer back to a particularly memorable game or moment. But we live in a world of Twitter and Facebook now. I can post links to the recaps on my Facebook page, my Twitter feed, and they can even be pulled into a type of newspaper delivered to your email called Paper.li. All are great tools, all feature content that I myself read, and, frankly, are the way people consume news now. But that doesn’t mean the “Press Roundup” is now worthless. It will be the place where I empty out my notebook from the prior week, take a look ahead at next week’s opponent, and maybe even something completely different. We’ll see how it all goes. It looked pretty grim – so grim, in fact, that many of the announced attendance of 6,386 had already left the stadium by th beginning of the 4th quarter. Central Connecticut State, behind a monster offensive performance by RB Rob Holloman, was methodically beating up the Lehigh defense. There the Blue Devils were, driving to start the 4th quarter, a Lehigh facemask penalty keeping their drive alive, and finally reaching 1st and goal at the Lehigh 9. It was the end of that drive, unbeknownst to all, that would be the difference between winning and losing their home opener. Here at LFN we continue our march towards the start of the Lehigh football season, which is only 38 days away. 38 days! At no. 38, we find another player from the local area, sophomore LB Noah Robb as our highlighted Lehigh football athlete in today’s countdown. Last season, there was little drama on the defensive side of the ball going into the spring season. With all-Patriot League names like DT Sajjad Chagani, DE Tom Bianchi, LB Billy Boyko and CB Bryan Andrews on the roster, you knew that the squad was more in a mode to “tweak” rather than to “retool”. This season sees not only these three position leaders graduate, but plenty more, making the defense much less experiences, and a much larger area of competition, than last season. I have some things to do before the 148th this weekend in Easton – namely, two weeks of players of the week (since I forgot for Holy Cross in my zeal to cover the Colgate game) and some links wrapping up last week’s game. Something that has muted the party this week has been the heartbreaking story of Lafayette QB Zach Zweizig, whose father, 56, tragically died from complications of a stroke earlier this week. My thoughts and prayers are with him and his family. I love “The Rivalry”, I really do. But some things transcend it.